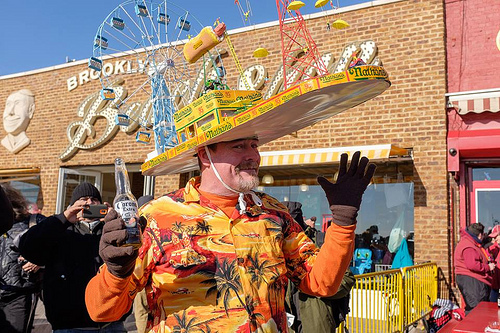 Brooklyn photographer Barry Yanowitz grew up in Coney Island and comes home every January 1st to photograph the colorful characters at the Polar Bear Plunge. “It’s the perfect way to begin the year,” he says. 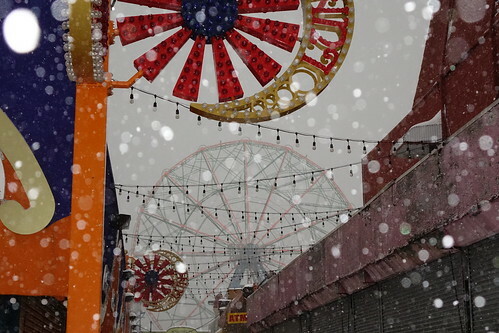 You can see more of Barry’s photos from his New Year’s Day set on his website. If you missed Santa and the New Year’s Day Plunge, you can join the Coney Island Polar Bear Club as a guest at their Sunday swims between November and April. This Sunday, the forecast is a balmy 58 degrees! Just show up at the Bears “Clubhouse” at the Aquarium’s Education Hall on the Boardwalk at West 8th Street by 12:30 pm with your bathing suit, a towel, surf boots or an extra pair of sneakers, and some warm clothing. 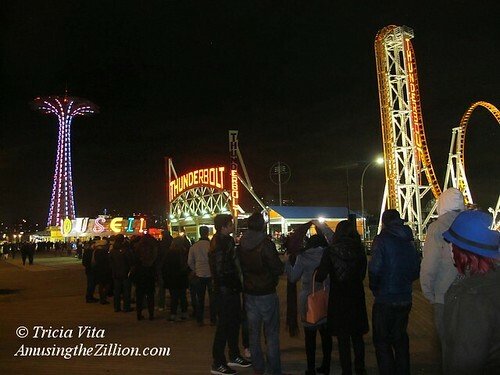 On Sunday, the 112-year-old Coney Island Polar Bear Club went for their first swim of the 2015-2016 season on the same day the amusement rides went for their last spin of the year. Today, Mayor de Blasio gave the Polar Bears a shout-out in a release for NYC & Company’s new winter tourism campaign. Called Unlock NYC and taglined “Find a Winter Less Ordinary,” the campaign was launched on Monday at World Travel Market in London. 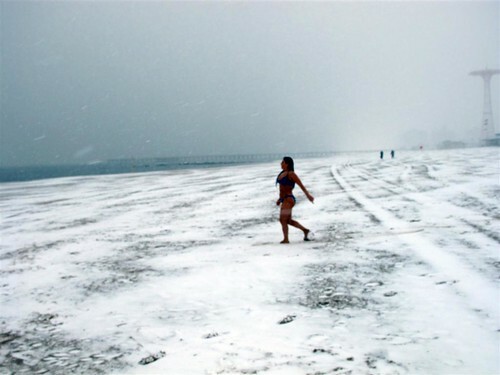 On January 1st in Coney Island, people travel from near and far to welcome the New Year by joining the Polar Bears’ annual dip in the icy Atlantic. 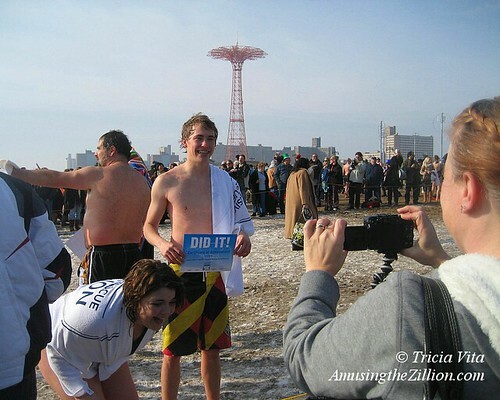 “I believe we had approximately 2,500 swimmers participate, very similar to last year,” Dennis Thomas, president of the Coney Island Polar Bear Club told ATZ a few days after this year’s swim. The event attracted just as many spectators and raised more than $70,000 for Camp Sunshine, where children with life-threatening illnesses can enjoy a summer vacation. The Coney Island Polar Bears, who have about 125 members, swim on Sundays at 1pm from November through April. If you want to join them for the 2016 New Year’s Day Dip or as a guest at a Sunday swim, here’s how. 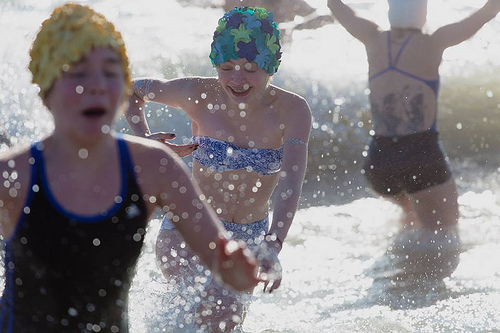 On January 1st in Coney Island, people came from near and far to welcome the New Year by joining the Polar Bears’ annual dip in the icy Atlantic. 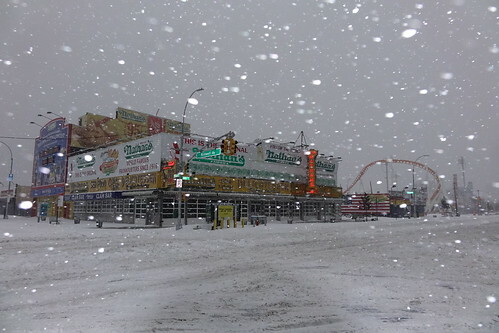 “I believe we had approximately 2,500 swimmers participate, very similar to last year,” Dennis Thomas, president of the Coney Island Polar Bear Club told ATZ. The winter bathing, which celebrates its 112th anniversary this year, raised a record amount–more than $70,000– for Camp Sunshine, where children with life-threatening illnesses can enjoy a summer vacation. Thomas said he expects the amount to rise a bit more in the coming days. You can make a contribution here through June 30. For Barry Yanowitz, who grew up in Coney Island, taking photos of the Polar Bear Dip is an annual ritual. 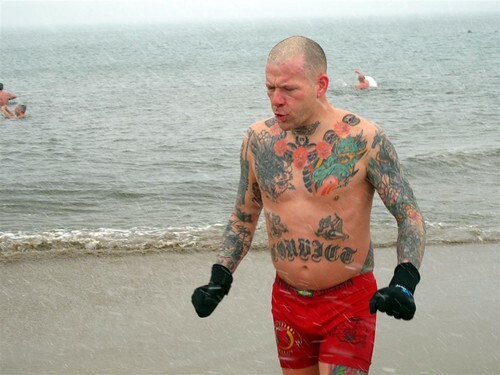 “It does take a certain amount of crazy to go swimming in NYC in January. But it’s a crazy that I admire!” said the photographer, who waded into the surf with water-proof boots and got a bit soaked taking the above photos. 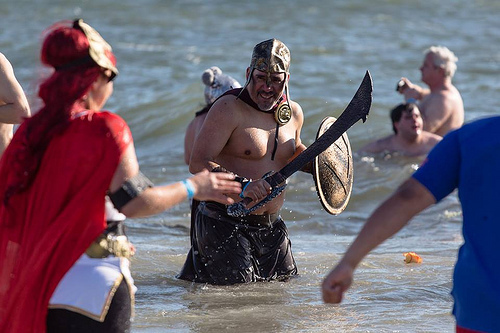 Afterwards, on the beach and the boardwalk, revelers in zany headgear, costumes and accessories reminiscent of the Mermaid Parade happily posed for portraits. You can view Barry’s complete set here. 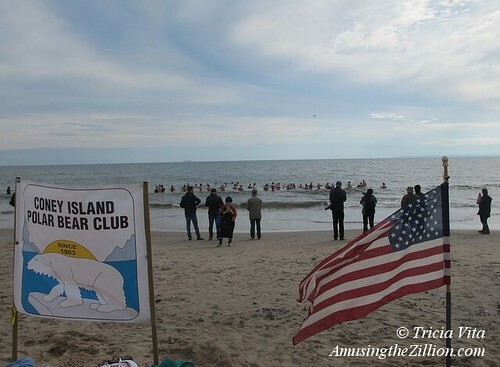 For a Coney Island Polar Bear’s eye view of the New Year’s Day Dip, check out this video by club member Jim McDonnell. The Bears, who swim from November through April, went for an early morning swim on New Year’s Day prior to the public festivities. If you missed the New Year’s Day Dip or want to give it another go, you can join the Polar Bears as a guest for one of their Sunday swims. Here’s how. 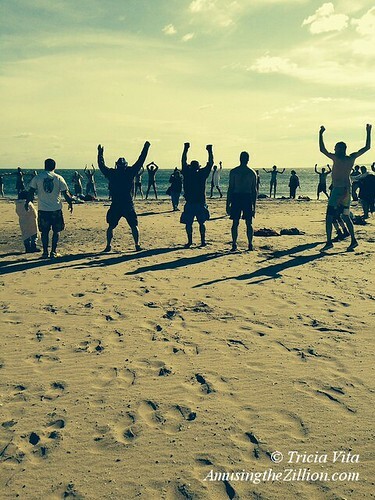 On Sunday, the Coney Island Polar Bear Club went for their first swim of the season. “Summertime has gone away, Polar Bears are here to stay,” the Bears chanted as they warmed up by doing jumping jacks on the beach. The Club swims at 1:00pm every Sunday from November through April. Membership is currently closed but you can join them for a guest swim. Just turn up at the Bears Clubhouse at the Aquarium’s Education Hall on the Boardwalk at West 8th Street by 12:30pm with your bathing suit, a towel, surf boots or an extra pair of sneakers, and some warm clothing. Or welcome the New Year by joining the annual January 1st Polar Bear Dip in Coney Island, a fundraiser for Camp Sunshine. Polar Bear Club member and filmmaker Jim McDonnell shot this short video of Sunday’s swim to mark the 111th season of the winter swimming club. It was a windy day on the beach and boardwalk with air temps in the 40s.